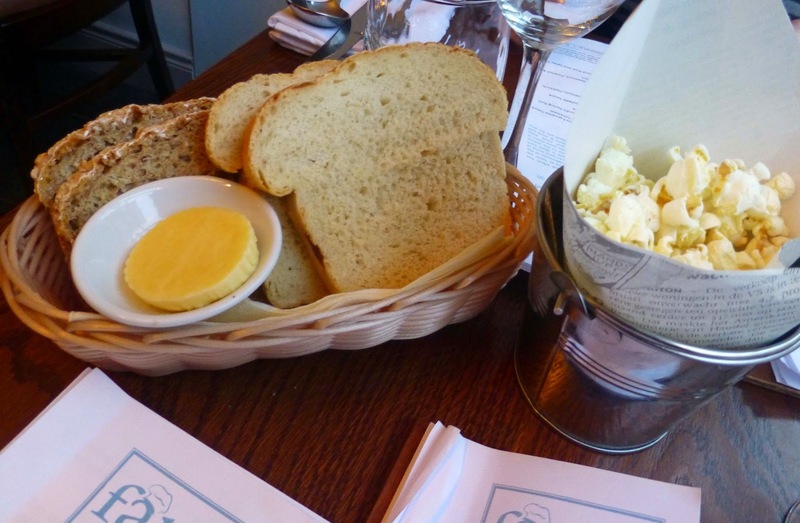 Clonakilty’s Farm Restaurant has made a big impression in less than six months. Produce from the local seas and farms features strongly on the menu in the Ashe Street venue, right in the middle of the town. Comfortable seating and friendly service, along with top class cooking, makes for an excellent dining experience. We were in last week and, with a chocolate tasting coming up immediately afterwards, decided to go for two courses of their early bird menu. 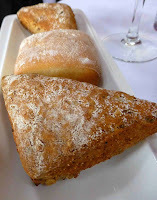 While reading the menus, we got a cone full of pop-corn and a basket full of gorgeous breads (including a particularly delicious one with onions and Dubliner in the mix - what a tasty crust this had). Delighted to see so many local names listed, including Clonakilty, Staunton’s, Dan Moloney, Caherbeg, Skeaghanore, Toons Bridge, along with craft beer by Dungarvan and cider from Stonewell. 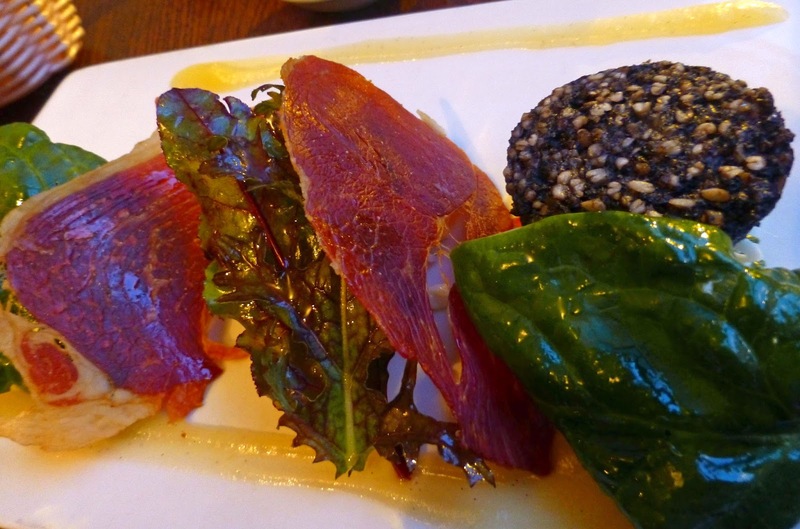 The Clonakilty Black Pudding featured on my starter, served with Crispy Pancetta salad with celeriac, Pear and Apple Coleslaw. 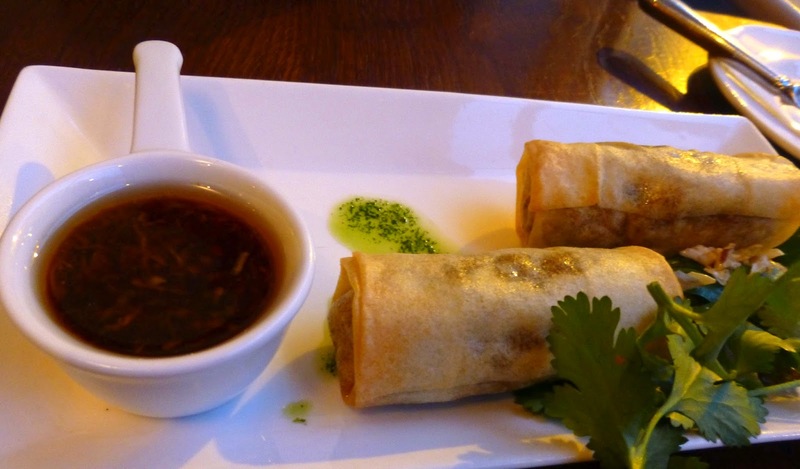 Delighted with that opener, excellent flavours and textures, and CL was more than pleased with her Crisp vegetable and chicken confit spring roll with Szechuan Dipping sauce, another tasty combination. It just got better after that. 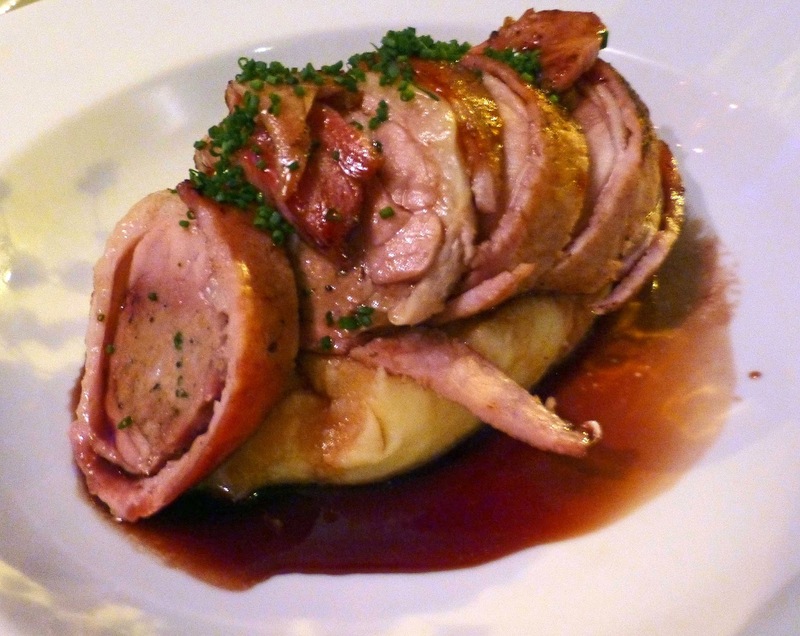 My mains was the Pan-roasted free-range chicken wrapped in Clonakilty Bacon and stuffed with Caherbeg Sausage meat. There was an explosion of flavours here, including a great sauce, and the sausage meat added a bit of herby spice. 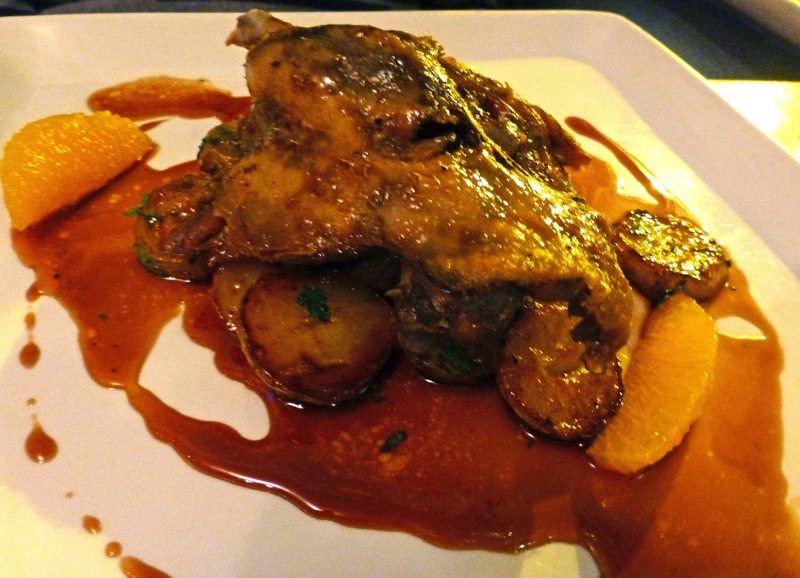 The other mains was Skeaghanore confit duck leg with marmalade sauté potatoes and that had CL purring. Another empty plate. Oh, by the way, the included sides of creamy mashed potato and vegetables were also cooked to perfection and very much appreciated as well. Must call back some day when we have no other eating commitments and get stuck into the A La Carte! Many of you will know that Barnabrow House is a special place for weddings. But did you know you can also enjoy a very special Sunday lunch there? 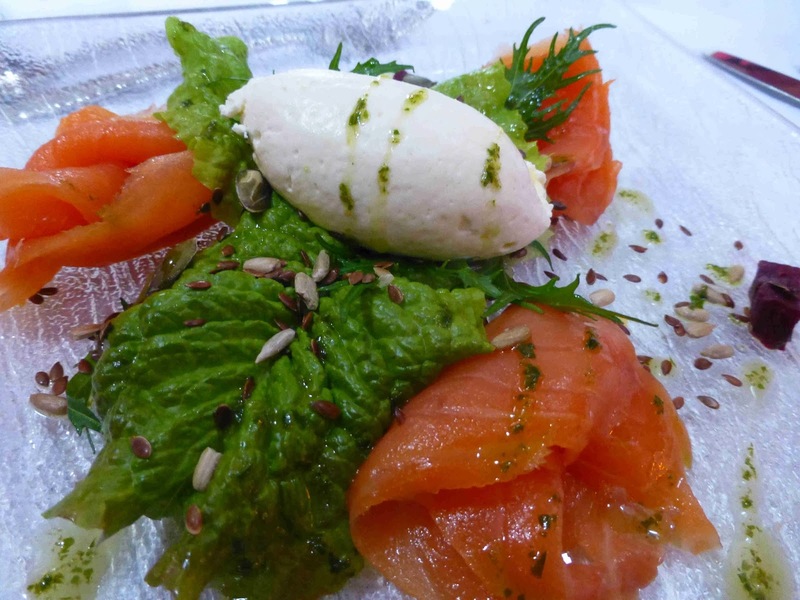 The quality of Stuart Bowes’s cooking is well known and the value is amazing, two courses (plus tea and coffee) for €20.00, three courses (plus tea and coffee) for €25.00. Take a stroll through the grounds before or after your meal and see the poultry, the donkeys and the goats. You will also spot the walled garden from which much of produce comes as you make your way to the church like Trinity Rooms Restaurant, beautifully decorated and furnished and also quite large. Here you see that local producers such as Green Saffron, O’Connell’s and Caherbeg appear on the tempting menu. We were there on Sunday and the place was full. And soon we were to see why. Not the longest of menus but still you need time to make up your mind. Eventually, I picked the Gulfstream oak smoked salmon with marinated roast beetroot, omega seeds and wasabi Chantilly. 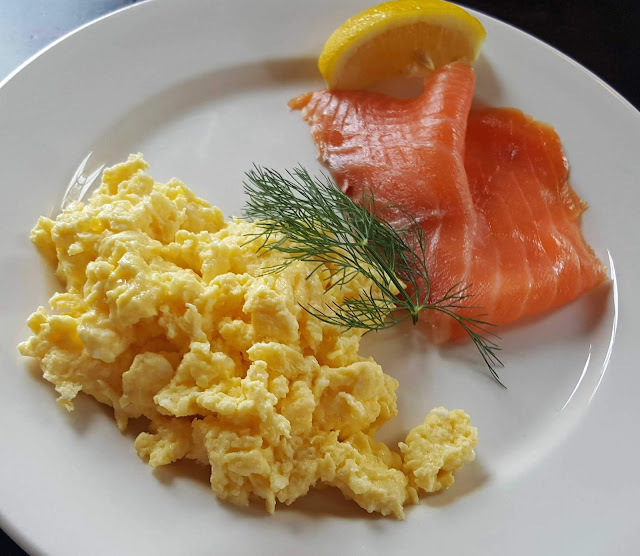 This is the same salmon that Bowes use on his famous Barnabrow Benedict for breakfast and it is gorgeous, enhanced by the accompaniments. 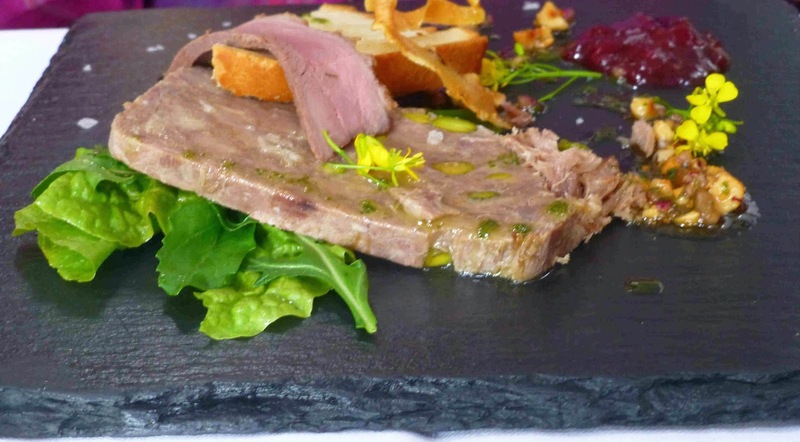 Our other starter was Confit Duck Terrine, plum chutney, hazelnut chutney and crisp bread. Add in a slice of duck breast and it was another top class treat. Other starters on the day included Gnocchi, roast garden veg, tomato, sugo parmesan and Soup (Roast tomato , almonds and herb oil). Could have eaten any of the main courses on offer. 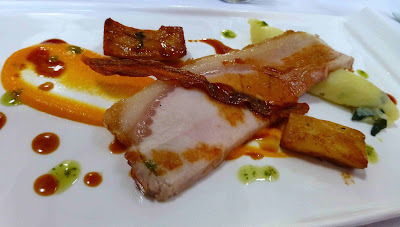 Did get a taster of their fabulous baked Caherbeg free range pork, colcannon potato, parsnip, carrot and Madeira juice. What a winner, the perfect match between the parsnip and the pork a particular highlight. But it was highlights all around here. 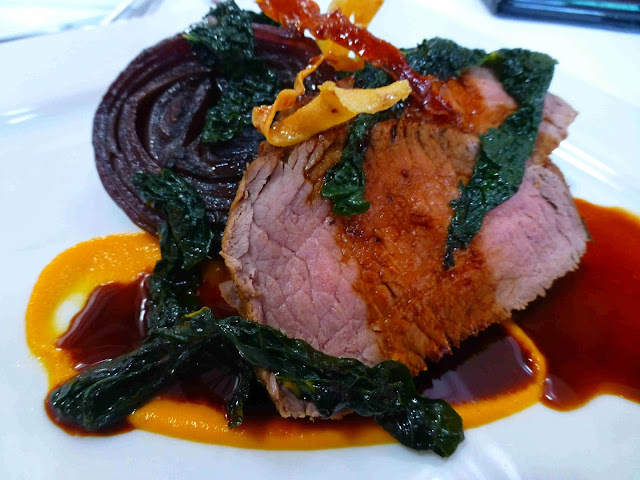 My main course of Roast Sirloin of O'Connell’s beef, cavalo nero, caramelised onions and Szechuan pepper sauce was incredible, so tender and full of flavours, all playing off one another, no element in the plate wasted, a perfect alchemy. Vegetables, with scattering of almonds to the left! Must say a word about the vegetables, a bowl of perfectly done (no bother to anyone whose teeth aren’t what they were!) roast potatoes and creamed cauliflowers and broccoli. 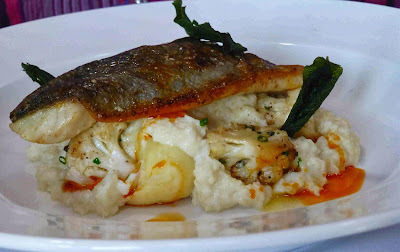 And our other main course was another flawless culinary joy: Pan Seared fillet of Sea Bass, with soft potato puree, cauliflower and parmesan risotto, smoked paprika. Could we be tempted by dessert? Well, with the kitchen in this kind of from, the answer had to be in the affirmative. 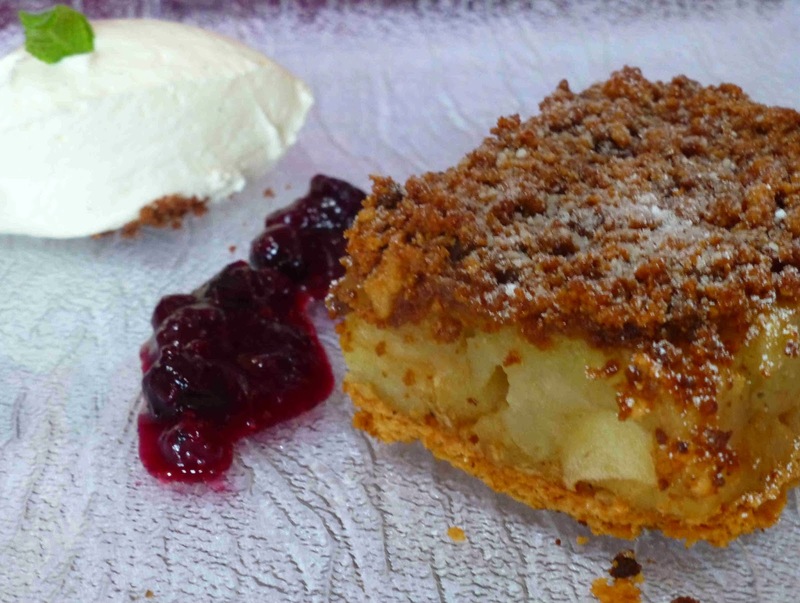 CL picked the spiced apple crumble with Chantilly cream, a seasonal delight, the spices by neighbours Green Saffron, the apples from Barnabrow’s own orchard! 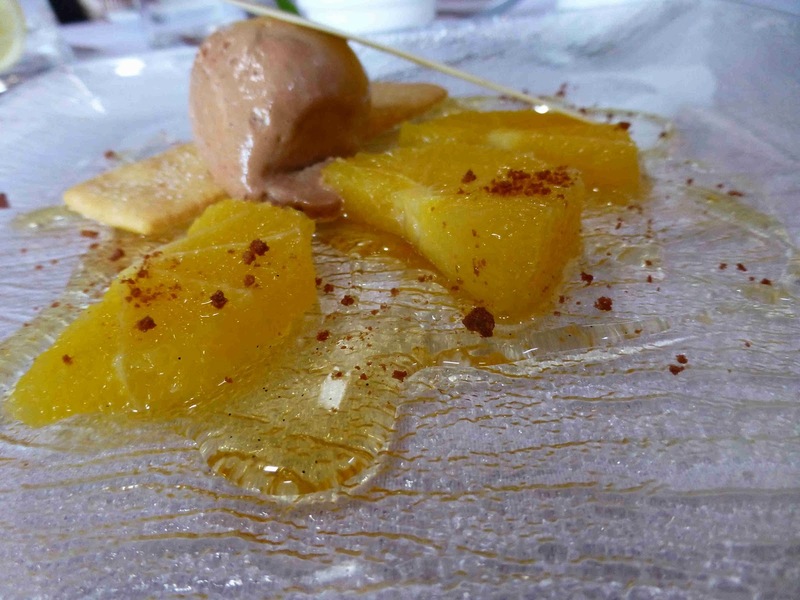 For me, it was the Milk Chocolate Mousse with spiced oranges and shortbread, a delectable pairing, another piece of magic from the kitchen. Service, as you might expect, is quietly excellent, courtesy and efficiency combined. As I said at the start, it is a rather special place thanks to the efforts of owner Geraldine Kidd, her Head Chef and their staff. Very highly recommended for your Sunday lunch.